The U.S. Army looks to adopt high-energy laser technology for the service branch’s fixed-wing and rotocraft aircraft platforms, Flightglobal reported Wednesday. “It’s a capability we’re interested in,” Col. Joe Hoecherl, Army Apache program manager, was quoted as saying. 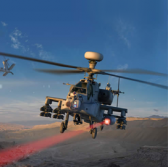 Ben Allison, HEL product lead at Raytheon, told Flightglobal the company aims to help address the Army’s airborne laser requirements after both parties tested a high-energy laser on a Boeing-built Apache AH-64 attack helicopter. The test was the first time a laser system engaged a target from a rotary-wing aircraft and conducted through a cooperative agreement between Raytheon, the Army’s Apache programme office and the U.S. Special Operations Command.